17th annual event held at Allen County Fairgrounds. 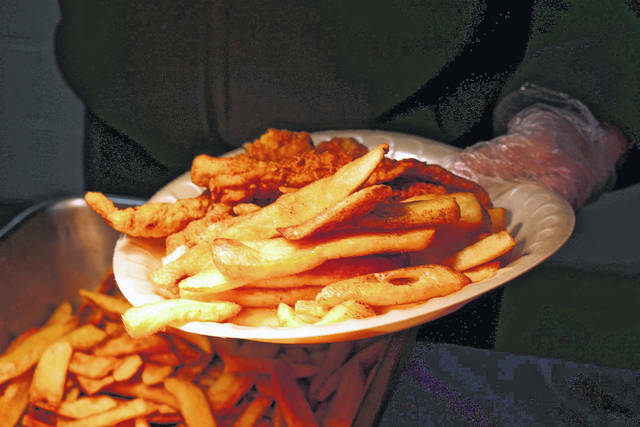 The Good Friday Fish Fry brought out more than 1,000 people to the Allen County Fairgrounds. The event helps the Ottawa River Coalition. LIMA — There’s something fishy going on here. The Ottawa River Coalition hosted its 17th annual fish fry at the Allen County Fairgrounds Friday. Organizers were expecting to serve close to 1,300 people. “[We expected to serve] 1,137 pounds of fish and people have been coming out very steady today. We’ve been very pleased with the turnout,” said Beth Seibert, Ottawa River Coalition coordinator. The meal, which included Alaskan Pollock strips, seasoned fries, coleslaw and a cookie, was catered by Lock Sixteen. The fish fry helps fund the Ottawa River Coalition’s many programs. “This is the one and only time we go out during the year to the public and this is our signature fundraiser, the Good Friday Fish Fry,” she said. “The funds that we raise from this event help us with our public awareness, public education activities. We’ve been here for 25 years now, but our most important role is helping a community connect with that river, helping with community awareness and building a sensitivity and a care and concern for this important natural resource that we call the Ottawa River,” she said. An Ottawa River clean-up event is scheduled for April 28. Volunteers are welcome to help the cause. This will be the organization’s 26th year for that event. Last year, 457 volunteers helped clean up the river. This year, the group also plans to help clean up some of the tributaries that feed into the Ottawa River. The Ottawa River Coalition is made up of 45 member and partner organizations.